The one thing no one told me about marrying someone in the military....was how lonely it can be at times. Moving from place to place can make it difficult to make a lot of friends. I have met some fantastic people through the military and enjoyed the time we have shared. But unfortunately most have already moved away to their next adventure. Deployments, unaccompanied tours, and trainings also leave many of us alone for weeks to months on end. Military spouses have been shown to have higher risks of developing mental health issues. These issues could be linked to separation, decreased social support, financial strain, unemployment etc. In a case study done by a group called "Eaton and colleagues," it was discovered that military spouses have nearly double the risk for developing a mental health issue. 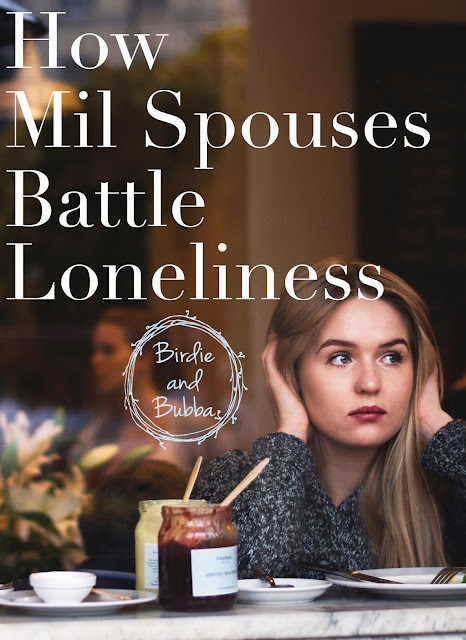 How can military spouses battle the lonely times? Here are some tips? - This could be developing a hobby, working, going to gym etc. I always found the quote "Idle hands are the devil's work," put the feeling of being "bored" perfectly. I feel more sad when I wasn't actively doing something. - My friends have heard an earful from me when I'm feeling down. I honestly feel better after just venting to someone who cares about me. - If you feel like you are becoming depressed or anxious more than normal, you may want to seek professional help. Military Family Life Counselors (MFLC) provides FREE short term, non-medical counseling to Active, Reserve, and National Guard members and their families. Therapy services are also made available through TriCare. Both programs will keep your conversations confidential except in cases like child abuse, domestic abuse, etc. - It is easy to feel overwhelmed when you are on your own. You have too much time on your hands or not enough. Making a schedule to help guide you through your day can keep you on track, help time go by quickly and assist in accomplishing goals. - Volunteering on post, joining a prayer group, creating a book club....the options are endless. Odds are, you are not the only spouse or military member experiencing loneliness. Army Community Service (every branch has similar programs) and MWR has great programs to meet other spouses on every post. Don't hesitate to reach out.